It’s an image as timeless as it is unchangeable – whether it’s a lavish Christmas feast or a quick country breakfast, there is one quiet, unmovable star of the show. This is the humble loaf of freshly baked Greek bread, called psomi in Greek, without which no meal is complete. From Michelin-starred restaurants to yiayia’s (grandma’s) kitchen table, bread is ever-present. It’s considered a must, not an optional extra. To Greeks, a meal without bread is just not done – it’s like making a Greek salad without the feta cheese. So deeply embedded is the ritual of bread with a meal that it makes an appearance no matter what the food, and is happily combined with other carbohydrates such as potatoes and pasta. Greeks love their bread. They’ll travel far and wide to follow up on rumors of an exceptionally good loaf, and even if there is a bakery on practically every street corner, they’ll still go check out the new one that recently opened, just to make sure. The neighborhood bakery is still king in this country. A 2010 report by the European Commission found that in Greece, the market share of plant style bakeries churning out packaged products was minute – around 2% compared to the European average of 45%. Greek bread comes in hundreds of varieties that can be used to map out your calendar of events. There’s the long, flat lagana loaf that is only made and sold for Clean Monday, round sesame covered koulouria grabbed on the go as breakfast, braids of stringy, sweet Tsoureki bread with bright red eggs baked into them for Easter, beautifully decorated loaves that are made for Christmas or weddings in some parts of Greece, funeral bread and, of course, the everyday horiatiko found in every household. The soft, springy bread so adored by Greeks today didn’t always look this way. Grains were a staple of the Greek diet in antiquity and it was the ancient Greeks who invented the Olynthus mill, two square millstones stacked on top of each other and turned with a lever. But the rocky landscape of the country was not conducive to growing wheat. It was, however, good for growing barley, prompting the Romans to refer to the Greeks as “barley eaters.” A simple flat bread made with barley wheat was the main staple, consumed with sauces, olive oil and lentils to dip into. 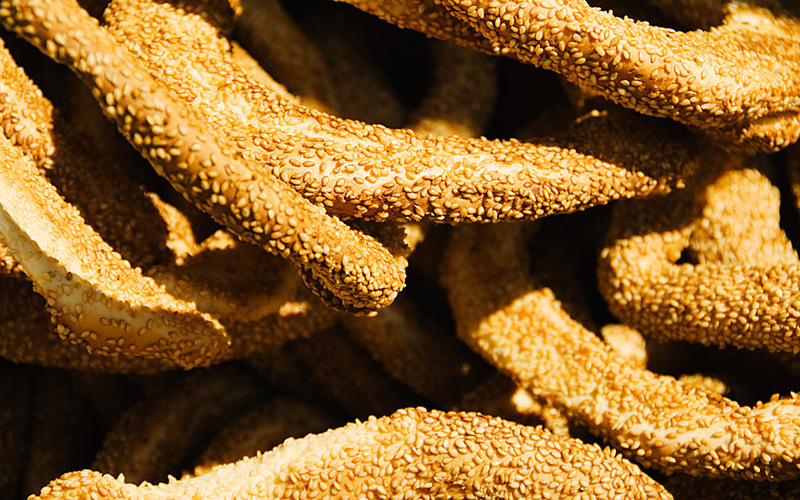 Round sesame covered koulouria are usually grabbed on the go as breakfast. 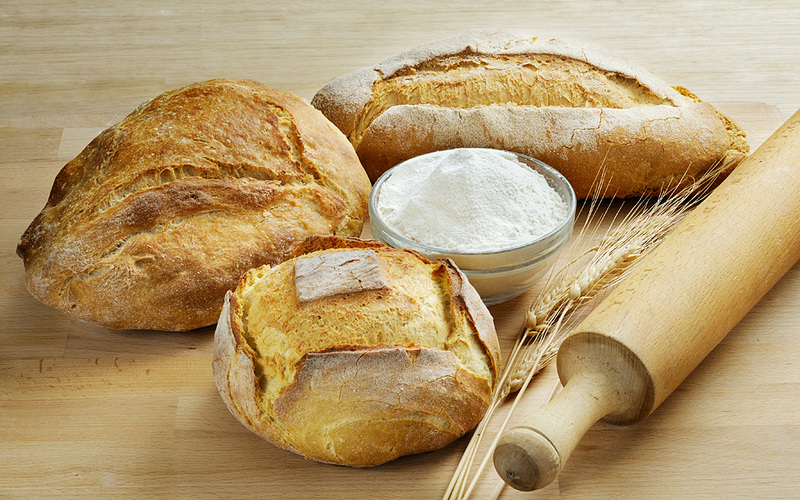 Before long, Greece started importing wheat and replaced barley flour with wheat flour to bake better bread. The ancient Greeks got so good at it that by 400 B.C., they had come up with around 72 different types of bread. Competitions were held to see which bakery could produce the best bread, with Athens becoming well-known for its loaves. In recent decades, bread has fallen out of fashion in much of the Western world, partly blamed for an obesity epidemic. Not so in Greece, where according to a report by the International Association of Plant Bakers, in 2013, Greeks consumed an average of 68kg of bread per person per year. Elena Paravantes, Food and Nutrition consultant, dietician and editor of www.olivetomato.com which gives tips and advice on following the Mediterranean diet, explains the Greek connection to bread. She describes the traditional diet of Greeks up until recently, which was mainly vegetables and lentils cooked in olive oil and sauces. As a dietician, Paravantes says that when it comes to the Greek obsession with bread, it’s not the bread itself that is fattening. “I see clients who worry a lot about bread and say they’ll stop eating it altogether. It’s not the bread; it’s what we do with it. If you’re eating a lot of bread with lentils for example, you’ll be dipping the bread in the sauce and the olive oil and that becomes a way of consuming more calories. Finally, beyond the comfort of fresh bread, the specter of famine still exists in the living memory of many Greeks. Between 1941 and 1944, the Nazi Occupation and subsequent Allied blockade of Greece caused the mass starvation of hundreds of thousands of people. Between April 1941 and June 1942, the price of bread increased 89-fold. Bread turned from being just part of a meal to a means of staying alive. The impact of these years has lingered in the subconscious of the Greeks and made its way into the language. Rather than saying “I’ll have a bite to eat,” they say “I’ll have two bites of bread,” which gave birth to the rousing 1973 anti-Junta slogan of “Psomi, pedia, eleftheria” (Bread, education, freedom). The order of those priorities is not necessarily accidental.